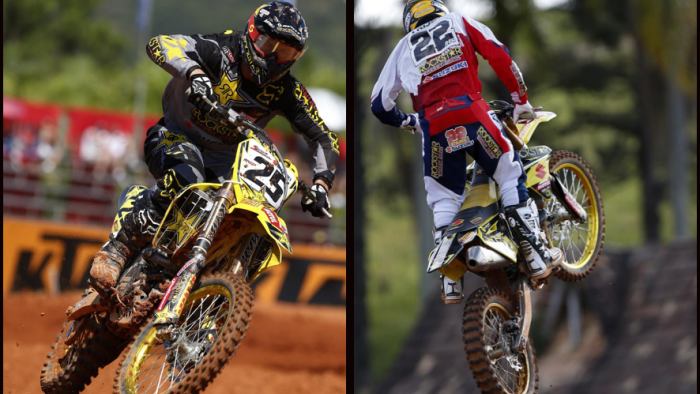 The Grand Prix of Brazil and the third round of 18 in the FIM Motocross World Championship was a positive one for Rockstar Energy Suzuki World MXGP as Clement Desalle celebrated his second podium result of the season in front of 35,000 spectators at Beto Carrero. The first of two outings in Brazil this season took place at the facility annexed from the popular theme park for the third year in a row. The small and narrow layout was again surrounded by a noisy and boisterous crowd. The gathering added that typical Brazilian flavour found at motorsports events, all in spite of an overcast sky and some stuffy air (temperatures touching 30 degrees with high humidity). Desalle flew his RM-Z450 to third position in the opening moto and held-off the attention of Max Nagl in the last two laps for arguably the hottest battle in the race. The Belgian was again at the front of the pack in Moto2 and although he could do little to prevent Antonio Cairoli to demote him to third place, his consistency delivered the runner-up position overall and his second trophy in as many Grands Prix. Fresh from sealing his second Pole Position in three Grands Prix, Kevin Strijbos endured some drama in the first moto when his goggle lens popped out and he had to pit for a new pair. Towards the end of the race the Belgian suffered some arm-pump and claimed 13th position at the chequered flag. The second moto was better for the 28 year old and although his sixth place was an improvement and better haul of points, Strijbos still felt below par with his performance and potential and ended the day with eighth overall. Desalle is now fourth in the MXGP standings with a 31 point deficit to Antonio Cairoli at the top of the table. Strijbos holds sixth after three races and is just 38 away from Desalle. The Belgian operation will pack the travel crates for the last time (until the second visit to Brazil in September for the penultimate round of the series) and head back to Lommel where a free weekend will precede back-to-back trips to Italy (GP of Trentino at Arco di Trento) and Bulgaria. MXGP Moto1: 1. Antonio Cairoli (ITA, KTM), 35:20.774; 2. Jeremy Van Horebeek (BEL, Yamaha), +0:15.869; 3. Clement Desalle (BEL, Rockstar Energy Suzuki), +0:20.205; 4. Maximilian Nagl (GER, Honda), +0:23.385; 5. Evgeny Bobryshev (RUS, Honda), +0:38.482; 6. Gautier Paulin (FRA, Kawasaki), +0:40.168; 7. Todd Waters (AUS, Husqvarna), +0:40.489; 8. Joel Roelants (BEL, Honda), +0:42.346; 9. David Philippaerts (ITA, Yamaha), +0:48.790; 10. Rui Goncalves (POR, Yamaha), +0:50.241; 13. Kevin Strijbos (BEL, Rockstar Energy Suzuki), +1:05.309. MXGP Moto2: 1. Antonio Cairoli (ITA, KTM), 35:51.801; 2. Gautier Paulin (FRA, Kawasaki), +0:05.250; 3. Clement Desalle (BEL, Rockstar Energy Suzuki), +0:08.899; 4. Jeremy Van Horebeek (BEL, Yamaha), +0:12.086; 5. Maximilian Nagl (GER, Honda), +0:17.009; 6. Kevin Strijbos (BEL, Rockstar Energy Suzuki), +0:20.798; 7. Rui Goncalves (POR, Yamaha), +0:47.380; 8. Matiss Karro (LAT, KTM), +0:50.317; 9. Steven Frossard (FRA, Kawasaki), +0:52.792; 10. Todd Waters (AUS, Husqvarna), +0:55.113. MXGP Overall result: 1. Antonio Cairoli (ITA, KTM), 50 points; 2. Clement Desalle (BEL, Rockstar Energy Suzuki), 40 p.; 3. Jeremy Van Horebeek (BEL, YAM), 40 p.; 4. Gautier Paulin (FRA, KAW), 37 p.; 5. Maximilian Nagl (GER, HON), 34 p.; 6. Rui Goncalves (POR, YAM), 25 p.; 7. Todd Waters (AUS, HUS), 25 p.; 8. Kevin Strijbos (BEL, Rockstar Energy Suzuki), 23 p.; 9. Joel Roelants (BEL, HON), 23 p.; 10. Steven Frossard (FRA, KAW), 19 p.
MXGP World Championship Standings (after 3 of 18 rounds): 1. Antonio Cairoli (ITA, KTM), 142 points; 2. Gautier Paulin (FRA, KAW), 112 p.; 3. Jeremy Van Horebeek (BEL, YAM), 112 p.; 4. Clement Desalle (BEL, Rockstar Energy Suzuki), 111 p.; 5. Maximilian Nagl (GER, HON), 110 p.; 6. Kevin Strijbos (BEL, Rockstar Energy Suzuki), 73 p.; 7. Steven Frossard (FRA, KAW), 68 p.; 8. Todd Waters (AUS, HUS), 68 p.; 9. Evgeny Bobryshev (RUS, HON), 67 p.; 10. Joel Roelants (BEL, HON), 61 p.